The evacuated tube collector is made up of three main components: an evacuated glass tube with a selective coating that optimizes absorption, aluminum fins that transfer the heat inside the tube to a copper heat pipe, and a heat pipe which transfers this heat to the water. One of the components that make the Sunbank so special is its evacuated tube collector. 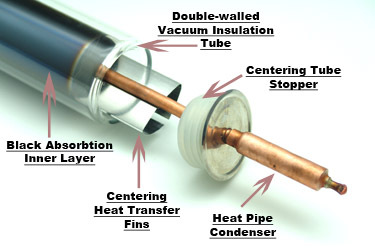 In a vacuum there is no heat transfer which means that the vacuum tube is almost perfectly insulated. Like an extreme version of a Thermos that keeps coffee hot, the Sunbank evacuated tubes preserve the 400 degree temperatures inside the tube while the outside remains cool to the touch. This allows that heat to be transferred to the water tank instead of being wasted. And because of this insulation the outside air temperature does not negatively affect the high heat transfer inside the tubes. There is no water in the evacuated tubes. This allows for excellent winter performance by transferring the heat into the tank with the copper heat pipe without any freeze concern. Also, if one tube is broken, the system continues to work without the tank draining. The fact that the collector is a tube with a circular shape, as opposed to a flat plate collector, means that the sun is always hitting the collector at a 90 degree angle throughout the day. This optimizes absorption with passive tracking. The Sunbank collectors are made more efficient by the three target selective coating of Al-N/Al. These three coatings create an anti-reflection layer, a transference layer, and an anti-infrared reflection layer. The evacuated tube is made of high-strength borosilicate glass, a glass with high chemical and thermal shock resistance that can withstand 25mm hail stones. Heat pipes act like a low-resistance thermal conductor. Due to their thermal-physical properties, their heat transfer rate is thousands of times greater than the best solid heat conductor of the same dimensions. The heat pipe transfers the high heat generated by the evacuated tube into a manifold that heats the water in the insulated tank. webpage. Heat pipes are one of the most efficient ways to transfer heat, and so your computer uses heat pipes to take away the heat from the processor so that your computer does not overheat. 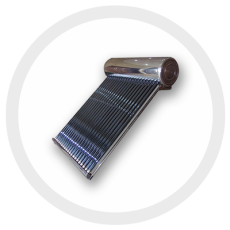 The Sunbank heat pipe is made of high quality copper that conducts energy extremely well. Inside the sealed heat pipe is a proprietary solution. When the temperature inside of the evacuated tube reaches 80 degrees Fahrenheit, this solution vaporizes and flows to the top of the heat pipe. At the top of the heat pipe is a condenser bulb, which fits into the manifold. It is here that the vapor releases its immense energy, condenses into a liquid and falls to the bottom of the heat pipe to start the process over again. This continuous cycle is what heats the water in the Sunbank. The aluminum fins holds the heat pipe in place and conducts the heat from the inside of the glass tube into the heat pipe. This heat is then transferred into the water tank which acts as a “battery” that is charged up ready to use when you are.